Democratizing access to knowledge with tools to communicate, share, educate, listen and learn. Digital media production and technologies empower students to learn and connect with the world in transformational ways. Across disciplines and in all sectors of business, video is used to communicate ideas and information with a worldwide audience. Understanding digital media technology and the craft of storytelling and messaging is essential for more than art and journalism students for whom this equipment is traditionally available. A central DML in the Library provides a high-use, low-cost, campus-wide resource, which provides all students with basic access to audio/video production technologies, software, and services. The Digital Media Lab will be located on the Library’s Main Floor just steps away from the front entrance, Checkout Desk and Library Café. The DML will include: five digital cameras with tripods and external microphones; three iMac desktop computers; three PC computers; and six subscriptions to Adobe Creative Suite. 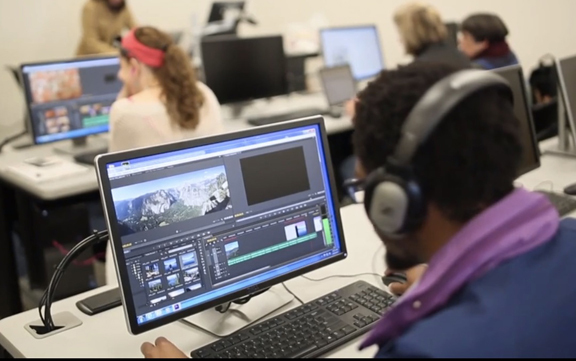 The DML will give HSU students the tools, training and professional software to edit video and photos, build web sites, create apps, design logos and layout magazines and books. Initial purchases for the HSU Library Digital Media Lab include: 3 iMacs, 3 PCs, 3 digital cameras, 3 subscriptions to Adobe Creative Software, furniture, etc. At HSU, across curriculum we are teaching students to tell stories in new ways that resonate with new audiences. These stories are important. We need this lab. There are 26 computers in the Multimedia Computer Lab in Gist Hall, which are in constant use. Students don’t have enough time to complete their projects. Having additional computers with digital media software in the Library will help. 70% of companies now say video is the most effective tool in their online marketing belts, and two out of three businesses expect it to dominate their strategy going forward.